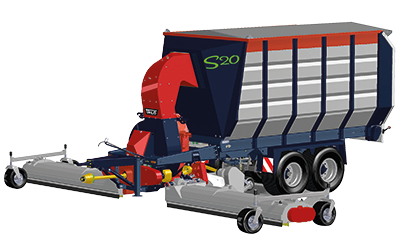 Wide area collectors with a loading volume of 14 – 20 m3 and a working width of 6 m. To achieve a transport width of 2,6 metres, both wings can be folded upwards. These machines are specially designed for removal of grass clippings and FOD from extensive grass areas around the airport and adjacent to runways (Runway Safety Area). This machine is exclusively for short grass management en 12 cm long grass cuttings. Despite their compact size, they have a large loading capacity and that saves a lot of time with driving back and forth from and to an unloading point. With a high working speed, a large wide area collector will sweep clean a large area. FOD that is present is collected with the grass clippings simultaneously and that way you can even limit the number of “FOD Walks”. A powerful fan providesan enormous suction power and is mounted in a housing fitted with a replaceable lining. The fan is driven by a PTO drive shaft attached to the tractor and requires an output of The required hp PTO can vary depending on the working conditions.90 – 110 HP (66 – 81 kW). • No unwanted fertilising due to older grass clippings.